Explanation: Aurora can make spectacular sights. 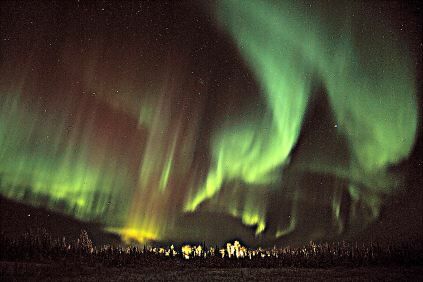 This particular aurora was photographed hovering over the town of Circle, Alaska. Although Aurora might first appear to be moonlit clouds, they only add light to the sky, and hence can not block background stars from view. Called "northern lights" in the northern hemisphere of the Earth, aurora are caused by charged particles streaming from the Sun entering the Earth's atmosphere. If viewed from space, aurora glow in X-ray light as well as in the visible! Several WWW sites can tell you if aurora are predicted to be visible in your area.